Obviously, there’s no built-in support if you want to stream videos from Apple’s iPhone or iPad to an Amazon Fire TV. But in this article, I’ll show you how to add AirPlay to your Fire TV so that you can stream content to your Amazon Fire TV (in the same way as you stream it to an Apple TV). 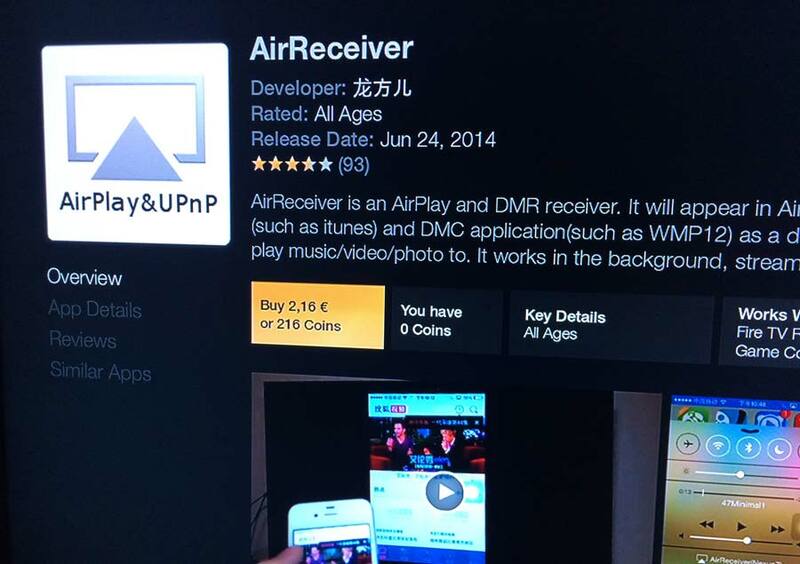 Start your Fire TV, search for “AirReceiver” and buy the App (about 2-3 Dollar/Euro). When the download is complete, open the App. From now on, you can find the App under “Apps > Your Apps Library”. Basically, the App is just a set of settings and runs in the background. The most important one is the checkbox for activating AirPlay. After enabling that, you should see the Fire TV from your iPhone (or iTunes, etc.) and you can start playing videos. 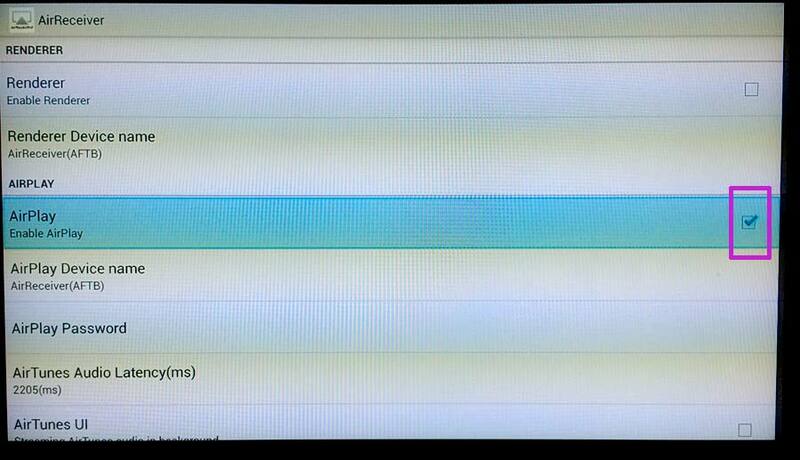 You can change the name of the fire tv with the on-screen-keyboard (the option is called “AirPlay Device name”). There are also some more options (like AirPlay Password, AirTunes latency, resolution, orientation). What works? What doesn’t work? AirPlay Mirroring from an iPhone or your Mac works great. The official FAQs list the following problems: Some services (like Netflix, YouTube, Amazon Prime) doesn’t work which I can confirm. If you want the maximum user experience without any troubles or problems, you should choose an Apple TV for AirPlay. Like always, if you stay in the Apple World, “you’re on the save side”. But if you only need AirPlay sometimes or for special use cases, you can consider also using an Fire TV for that. Do you have any experiences with AirPlay and Fire TV? Any hints? Just leave a comment. How do you mirror from a MacBook? I have an Amazon Fire stick. How do I stream from my phone or computer to fire stick? There is ArkMS application for that. I’ve been using it for a long time. The main plus is that it works without any bugs and streams very fast all your media to different devices. Hi Flo- Great tutorial! Have you heard of younity? This may seem stupid, but I would like to do reverse. I have fire tv. In living room and would like to send what I’m watching to my sons iPad in his rom so he can watch what we are watching on his iPad with head phones, since home work is from 6-7:30 he must stay in his room even if done, but don’t want to disrupt his brother still doing homework. All our content is Amazon prime and purchased and stored on prime, I could allow him to control prime but I’d prefer he’s watching what I am so he can join right into a movie were already watching, just seems I should be able to flip source rather than its always iOS source to larger tv. Any suggestions? ive got a real dumb solution for that… Start the AirPlay stream from the iPad. Then when you turn off AirPlay it’ll be back on said iPad. Clever. Hi I’ve installed the ap on the firestick enabled AirPlay but it’s not coming up as a available blue tooth device on my iPad 2 what am I doing wrong? its under airplay not bluetooth. look up what airplay is and how to access it on your device. Hi, I have gone through the set up process but I am getting an error code (-6727). Any insight? My question is different: I have Netflix installed on amazon Fire, and would like to watch movies from there to my Apple TV. From my iPhone I can choose to play a video on the Apple TV. From my Amazon Fire I do not see that option. Is there n app to get that? Hi does this work for the fire stick as well as the fire tv? My question is that certain apps I have on my phone like cbs or free form are not part of the fire stick. I’d like to use AirPlay to be able to watch my shows in this app while mirroring my phone with the tv. Do you think that’s possible? How can I send (*not receive*) audio to Airplay speakers from an Amazon Fire TV? I want to pipe the audio coming from the device to a set of Airplay speakers but somehow cannot find any information or third party apps on how to make that happen.. I want to do the same as Pete. Not from a device to the fire stick but from the Fire stick to many airplay speakers. Set-up my MAC to airplay to Amazon firestick with Air Receiver installed, no problem when sending my screen to the tv, then went to add a new additional Firestick on the downstairs tv with air receiver installed, I give it a different device name. From my MAC I can see both devices when clicking on the airplay symbol but the screen doesn’t transfer anymore, just says it cannot connect to either tv… Any ideas? If you haven’t already, try going to the “Settings” – “Display and Sounds” , then “Audio” and go through all the different Dolby settings – remembering the one you’re already on that works with everything else. Sometimes having the wrong setting here will block audio. How can I watch Netflix installed on my iPad on a TV with Amazon Fire Stick? This app does’t work, as you wrote. Unfortunately, Amazon Fire has blocked Netflix app outside US, and I am in Uruguay! Hi Im trying to miror a movie with subtitles on air play. And it mirrors great the movie but without subtitles. And I dont know why ?! Also the format is maybe to big so I would need to push the picture up a bit to see the subtitles but how can I do that? 1 – Your TV may already be in a zoomed mode. Refer to your TV’s settings and look for “Display”, “Aspect” or “Aspect Ratio” – It should be set to 16:9 – not zoom or any other. 2 – Fire Stick also has a Display adjustment. Go to “Settings”. Then “Display and Sounds”. Then “Display” and click “Reset”. There’s a pretty nifty gadget there for adjusting screen size. 3 – It’s possible that CC doesn’t get transmitted and needs a 2nd decoding. Perhaps enabling CC on your TV? That’s all I can think of. I have the same issue as Rudy… The iPhone just says “looking for Apple TV??? I have the same issue as Bob and Rudy. Is there a solution???? Is there a way to view the dvd i’m watching on my macbook, through the fire stick to the TV… when I try mirroring my macbook while a DVD is playing in it, the tv just comes up with a blank screen…? Works on my iphone 7 but not my Macbook pro (was able to connect but just shows a black screen). thoughts as to why this is happening? Sorry but my iPhone 6s doesn’t see any device on the list. Any solution? When you say at the end “you’re on the save side”, what do you mean? What is a SAVE SIDE? “you’re on the save side” -> I meant: If you want to make sure that it will work without any problems. Hi I have downloaded Air Receiver all works fine on my new Samsung Smart TV except playback of videos from iTunes. The voice and Video do not sync correctly I.e being slightly out. If I mirror my phone from other sources like Utube it works perfect. Any help would be greatly appreciated. Hi have a fire tv box connected by Ethernet to the rest of the network. How can I use this app to connect my iPad to the fire tv if using Ethernet? The fire tv can’t use Ethernet and Wi-Fi at the same time. My opinion of Firestick is that it is a waste of money for anyone who already has Freeview access, and not a patch on Google Chromecast, that allows me to stream from that wnich I need from my IOS devices without the necessity of any add ons. Hi, Great article. I followed the instructions and can hear audio of my Itunes movie but what I see is a picture of the move (like you would find on the cover of a dvd). It doesn’t mirror the video. I have the original fire tv not the stick. Is there something that I need to reset or have there been changes where mirroring movies is no longer allowed?